One critical part of 3D printing is the software used to design, output (or convert), repair, and then process 3D models into code that can be understood by the 3D printer. Slic3r, designed by Alessandro Ranellucci, is an open-source conversion tool for 3D-model processing for printing. 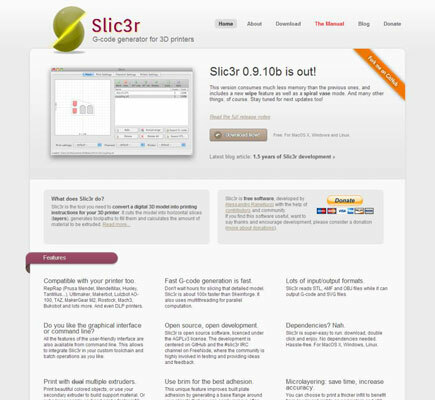 The Slic3r software can be downloaded for PC, Mac, and Linux at www.slic3r.org. Slic3r is in a constant state of upgrade, which makes it an ideal choice for the rapid developments in 3D printing. Many enhancements are constantly proposed and produced by the community; check back often to find out what’s new or improved. The main task for any 3D print-slicing program is to cut up a model into fine layers all geometrically and dimensionally correct and plan paths for the extruded material used on each layer. When the print-slicing program does its job correctly, the 3D printer’s firmware processes this data and controls the movement of the printer’s components to print out the finished model. The slicing program also analyzes the model for printability, and can then decide whether additional commands are needed — whether to print extra material to help support a bridge, for example. Further, if you select to use support material, the slicer will do best to add the required breakaway support material without your needing to change the model. Thus a slicing program must apply some intelligence to slicing a model; providing overhangs of material and sections of bridging may require changing the perimeter outlines of the object or detecting when solid layers that go in a specific direction must bridge a gap in an object to keep the print strong and appealing in its final appearance. RepRap 3D printers use a control language called G-code, as do the full commercial 3D printers that cost upwards of $50,000. G-code is an industry standard set of commands and codes used to script the path that a 3D printer (or even a CNC milling machine) uses to produce a 3D object. Thus all the software tools used for RepRap can also be used for high-end machines. The difference with RepRap is that the further development of G-code is highly dynamic; new codes and commands can easily be added to the G-code set as the technology develops further. Many different slicing programs exist for 3D printing, but Slic3r is a favorite with RepRap users all over the world. Other slicing programs you may wish to investigate include Cura, Repetier host, and Kisslicer. Netfabb is a very powerful commercial software package that is ideal for many aspects of 3D file manipulation. It’s not open-source, but a basic version that’s still amazingly functional is available for free download from www.netfabb.com. RepRap users favor Netfabb basic for checking model files prior to sending them to the slicing program. Netfabb allows you to rotate, scale, and modify (or fix) your object models. Loading a model into Netfabb before loading it into Slic3r enables you to ensure that the model looks 3D-printable, that it is in the correct orientation, and that it will print out at the size you expect and require. Netfabb basic is available for Windows, Mac, and Linux. A cloud-based version is also available and is often even better at fixing issues with 3D model meshes that have errors or refuse to slice correctly. Professional versions along with specific packages of Netfabb tailored for different 3D printers (including the Ultimaker) are available to buy. Pronterface is an open-source RepRap user interface for controlling your 3D printer and sending G-code files off to print. The complete Printrun package of software was developmed by Kliment Yanev and is widely used in the RepRap home 3D-printing community. The Printrun package is available for Windows, Mac, and Linux from http://koti.kapsi.fi/~kliment/printrun/. Pronterface is an essential program for the easy use of your 3D printer. Pronterface can also be linked with Slic3r. Doing so allows you to load model files and run background slicing into G-code with Slic3r from the set profiles you’ve already defined. Repetier-Host is an alternative slicing engine and control panel for your 3D printer. It’s similar to Pronterface and Slic3r in function, and can be linked to Slic3r. Repetier-Host is available for Windows, Mac, and Linux, and can be downloaded here: http://www.repetier.com/download/. ReplicatorG is another well-established open-source package for both model slicing and 3D printer control. It has been widely used by some closed-source manufacturers of 3D printers, but has yet to attain wide popularity with RepRap users and developers. ReplicatorG is available for Windows, Mac, and Linux, and can be downloaded from http://replicat.org/.